Sometimes the “golden years” do not feel very golden. In fact, dealing with the many ailments can feel overwhelming at times. That is where Easter Seals Senior Services steps in to lend a helping hand to ease your way gracefully through the golden years. Easter Seals has many types of services to help seniors remain independent and safe living at home. The In-Home Services program and Personal Attendant Services (PAS) are available to a broad population including seniors, who could benefit by having a “caring partner” or an assistant help with daily needs. Both services provide assistance in areas, such as: companionship, meal preparation, light housekeeping, performing work tasks and bathing needs. It is easy to get started with In-Home Services. Each person’s needs are different so Easter Seals offers a free, confidential in-home evaluation. This meeting will establish an individual care plan as well as address: routines, health needs, cost of services and transportation requirements. A suitable caring partner will be paired based on the needs of the person. All caring partners are carefully screened employees of Easter Seals and undergo thorough background checks, are bonded, insured and have current First Aid/CPR training. The PAS program puts you in charge as the employer. You are able to hire family or friends as your attendant. You decide how much they are paid, when they come and how to do things. Easter Seals will assist in any technical aspects of being an employer. You must qualify for Medicaid funding to be eligible for this program. Easter Seals Adult Day care program serves adults who have experienced a disabling condition such as Multiple Sclerosis, stroke, brain injury, other physical limitations and conditions of aging. Transportation and meals are provided to the participants. 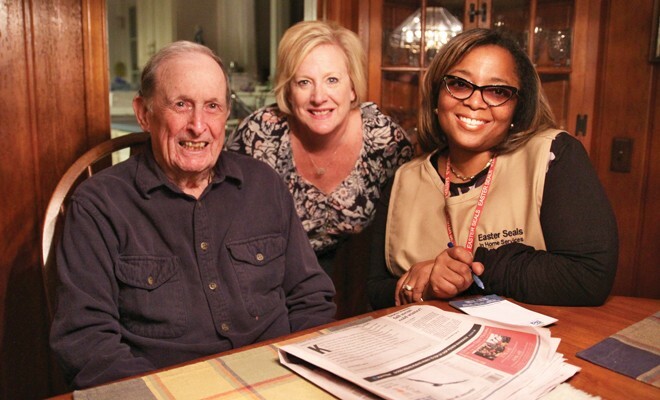 The adult day care program offers a break for family caregivers responsible for a relative who is unable to function independently, but does not require 24-hour nursing care. Nursing support is provided to all participants. A full time nurse provides medical support including monitoring of blood pressure and blood sugar, coordinating with physician offices and arranging appointments. The nurse acts as a liaison between participant families, case managers and other health care providers. Easter Seals provides physical, occupational and speech therapies on site, which, if needed, can be added to the individual’s personal care plan. In addition, trained staff are able to help all participants with activities of daily living and personal needs. Like all Easter Seal services, the adult day care services are comprehensive and individualized to meet each client’s needs, family-focused to meet each family member’s concerns and have the goal of enhanced independence. Participants are encouraged to choose from a variety of activities such as arts and crafts, exercise, community trips, computer access and more. A lower-interest loan through Easter Seals FYI: Finance Your Independence Assistive Technology Loan program may also help make your home and life more accessible. The FYI program can help with home modifications to make it possible for an aging parent to stay in their own home or move into yours, finance a computer to accommodate visual limitations or even lower cost items, like hearing aids. If you have hesitated to make these changes because of cost, Easter Seals can help. As part of their Community Outreach Program, Easter Seals is now assisting Delawareans in securing lower-interest loans to purchase assistive technology or make modifications for accessibility. The loan program is made possible through lending partners Del-One Federal Credit Union and DEXSTA Federal Credit Union. The FYI program is part of Easter Seals Community Outreach Program (COP). Under this program Easter Seals also provides grants to support family caregivers providing care to a person of any age or disability. Partially funded through Delaware Division of Services for Aging and Adults with Physical Disabilities, the Caregiver Resource Center is another part of the COP that is available to those caring for a loved one. The Money Management program can also assist seniors in keeping track of their finances. Easter Seals’ Case Manager is on site every day to provide information, resources and support to family caregivers. Along with Senior Services, Easter Seals offers a range of other services, including children’s therapies, assistive technology, recreational camping, day programs for adults with physical or intellectual disabilities and respite services for caregivers. For more information on services, contact 1-800-677-3800. Next Story → Does Your Neck Make You Look Old?